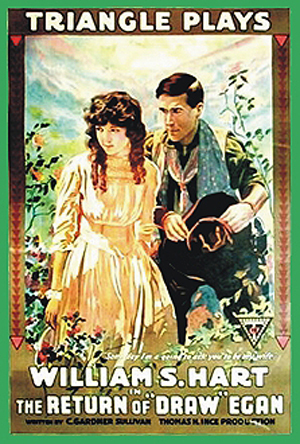 THE BARGAIN (1914, Paramount) William S. Hart, Clara Williams, J. Frank Burke. After a bandit (Hart) robs the stage he is wounded while trying to flee. He’s taken in by a rancher who allows him to heal up. Bill then falls in love with and marries the daughter of the rancher. With a desire to go straight, he tries to return the stolen money but is recognized and captured! RETURN OF DRAW EGAN (1916) William S. Hart, Louise Glaum, Robert McKim. A gripping Hart western drama. An infamous outlaw, Draw Egan, is named new sheriff in a small town, his career as a bandit being unknown to his supporters. Draw delights in mixing it up with the local riff-raff. Then an old gang member shows up and threatens to expose him! Lots of pathos as Bill stands to lose his new life and the girl he loves. Music score, From 16mm. KNIGHT OF THE TRAIL (1917, Tri-Stone.) William S. Hart, Leona Hutton, Frank Borzage. A great amount of female drama ensues when Bill’s fiancée finds out he’s actually a holdup man. She dumps him! Bill wins her back, though, by saving her money from a shyster. A fine two-reeler. Music Score, From 16mm. WAGON TRACKS (1919) William S. Hart, Jane Novak, Robert McKim, Lloyd Bacon. Another Hart classic. When his brother is shot and killed, Bill is led to believe that a young woman on his wagon train did it in self-defense. Later, he finds this not to be true, so he forces a showdown with the killer. Complicating matters even further is a band of Indians wanting blood! Music score, from 16mm.